Former President Mohammad Khatami has told student groups that subversive elements have no place in society and anybody who honors the Constitution is an Iranian citizen irrespective of their beliefs. Highlighting the fact that university students need to be equipped with the means of critiquing and evaluate themselves as well as society, the founder of BARAN [Foundation for Freedom, Growth and Development of Iran] Mohammad Khatami said that a security atmosphere won’t ensure security. “Reformists and university students should critique themselves. Evaluation of society is also necessary. Have we ever wondered whether every single individual of society meets the requirements for democracy? Have you thought about the reasons why such factors are absent? Critiquing is not the same as fault-finding. Far from that, it is intended to expound on weaknesses and strengths. “We want all advantages associated with republicanism, including freedom, freedom of speech and assembly, the decisive role of public vote and the right to self-determination. Also, we want morality and justice which are the core principles of Islam. That is the kind of Islamic Republic we are after, the republic in which people are free and morality reigns supreme, not the one where the most immoral behaviors and deeds are imposed on society in the name of Islam and revolution, where liars lie with impunity. Such behaviors run counter to human nature and [after a while] those who come under fire and are libeled will gain popularity, while liars and those who slander will fall from public grace,” Khatami said. Khatami stated that no society deserves to be under a security and military atmosphere, let alone [Iran’s] society whose revolution has been Islamic and popular. “In today’s world, a security and military atmosphere cannot ensure genuine security. Freedom and prevalence of an open atmosphere in universities are more essential than the air for breathing. University students should define their activities within the framework of the establishment. When some unfair measures are taken, it’s because the establishment is subjected to injustice. Those who pass off their own tendencies and taste as those of the establishment and try to repel everyone are doing injustice to the establishment. We are the ones who back the establishment; we support its values and want to move down the same path which is in line with the Constitution. We should hold dialogue with others and reach the conclusion that the security of the country cannot be ensured by fostering a security atmosphere,” Khatami added. In response to a question about the performance of the government, Khatami stated, “Although you are not restricted and you can critique the government as well as those in power, you should take into consideration that the government is wrestling with major issues. It’s true that what is pledged has not been fully fulfilled, but those promises are not expected to be honored overnight. President Rouhani and his government are committed to their vows and they should be helped. There are numerous problems and in fact the damage caused in the past – which I do not want to say was done wantonly – has caused many problems for the country. The efforts of the government to clear those hurdles are up to par. He went on to say that if foreign problems are solved, many problems we face at home will be ironed out, but dealing with outside problems should not prevent us from attending to what is problematic inside the country. “A government which has risen to power as a result of popular vote follows people’s demands. Moderation is a method and reform is a discourse. Although the formation of the latter dates back to 200 years ago, people – with different tastes and demands – have stood by it. 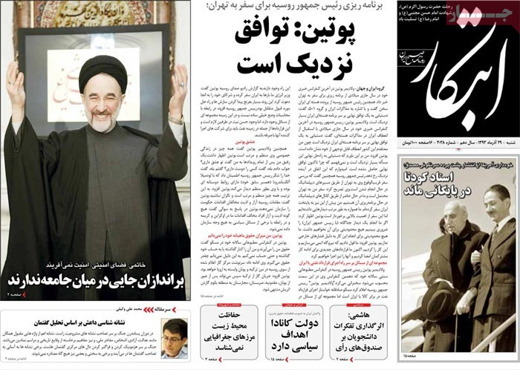 Khatami further said, “The reforms discourse has its roots in the conscience of people. Reformists confirm moderation. The stage should be set for the materialization of moderation which is exactly what people are calling for. The way should be paved to have moderation, interaction, dialogue and discussions. “Reformists have repeatedly said that they oppose subversive measures. Subversive elements have no place in society. We are seeking the progress of the country and the establishment, and we are all moving in line with the Constitution. The Constitution may come in for criticism, but it’s the base on which society moves forward. It is not a disposable to be thrown away after single use. We fully abide by the Constitution, and whoever respects it is a citizen of the Islamic Republic of Iran and is entitled to all civic rights regardless of their beliefs. If some people claim otherwise, we need to exercise patience and have dialogue”. The students present in the ceremony called on Khatami to pay more visits to cities across the country and have face-to-face dialogue with people and students. They also took a swipe at the current state of affairs in universities where, as they said, a security atmosphere prevails. They also criticized the government’s treatment of students. The students expressed concern about the upcoming parliamentary election and asked the former president to have a more active presence in politics.